Are Americans Polite Because They Feel Superior? Today I’m over on PoliticsDaily.com talking about his thesis and adding my own two…pence. 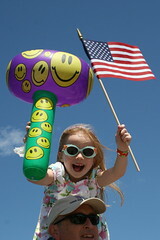 Image: Smiley American Girl by cproppe via Flickr under a Creative Commons License.